Richard Adam Bielski (born September 7, 1932) is a former American football running back in the National Football League for the Philadelphia Eagles, Dallas Cowboys, and the Baltimore Colts. He played college football at the University of Maryland. He signed with the University of Maryland where he played on offense and defense as a fullback and linebacker. He was also an excellent placekicker. In 1954 he was a preseason All-American candidate, but injuries affected his level of play during the season. Still, he was able to finish his college career averaging more than 5 yards per carry and was considered one of the best fullbacks in the country along with Alan Ameche. At the end of the year he was selected to play in the Chicago College All-Star Game, Senior Bowl and the North-South Shrine Game, where he was voted the outstanding player of the game. 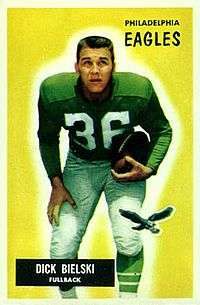 Bielski was selected by the Philadelphia Eagles in the first round (9th overall) of the 1955 NFL Draft, becoming the first running back from the University of Maryland to be drafted this high. During his first years, he didn't live up to expectations at fullback and had a greater impact as a placekicker. Being considered a versatile player, he was converted into a tight end in 1957. After the 1959 season, the Eagles left him off their list of players who were exempt from the 1960 NFL Expansion Draft. Bielski was acquired by the Dallas Cowboys in the 1960 NFL Expansion Draft. He was involved in the record for the shortest touchdown pass in league history, after catching an Eddie LeBaron pass from the 2-inch line against the Redskins on October 9, 1960. During those early years the Cowboys' roster was in a constant state of flux, but he was part of the nucleus of a good offense, that was composed by Eddie LeBaron, Don Meredith, Don Perkins, Frank Clarke and Billy Howton. In 1961 he earned his only Pro Bowl berth, with career highs of 26 receptions for 377 yards and 3 touchdowns. He also took over the placekicker duties from Allen Green, for the final five games of the season. Bielski became part of the franchise's legacy of Pro Bowl tight ends that includes: Jim Doran, Lee Folkins, Mike Ditka, Billy Joe Dupree, Jackie Smith, Doug Cosbie, Jay Novacek and Jason Witten. During the 1962 offseason, needing help on defense, the Cowboys traded him to the Baltimore Colts in a three-team deal. The Colts then sent a third round draft pick (#33-Mike Fracchia) to the Saint Louis Cardinals, and in return the Cardinals sent safety/punter Jerry Norton to the Cowboys. Dallas then traded an eight round draft pick (#104-Keith Kinderman) to the Green Bay Packers to pick up tight end Lee Folkins, who replaced Bielski. In 1962, he played as a fullback and placekicker. He spent two seasons with the Baltimore Colts before retiring. In a nine-year career he had 107 receptions for 1,305 yards, 229 rushing yards and 12 touchdowns. He also kicked 58 extra points and 26 field goals. After his playing career, he enter the coaching ranks. He served as an assistant coach with the Washington Redskins for four seasons, and as a wide receivers coach for the Baltimore Colts under head coach Don Shula,. Bielski coached the Washington Federals of the United States Football League as offensive coordinator and then head coach for the final 17 games of the 1984 season, going 3–14. ↑ Colts, 'Skins coaches no strangers, Beaver County Times, November 5, 1977. ↑ Colts Discharge Sandusky And Five Assistant Coaches; COLTS DISCHARGE SANDUSKY, 5 AIDES, The New York Times, December 21, 1972. ↑ Ray Jauch fired; Replaced by Bielski, The Windsor Star, March 1, 1984.